On the body of the pot there’s a notch at each litre that the pot can contain. 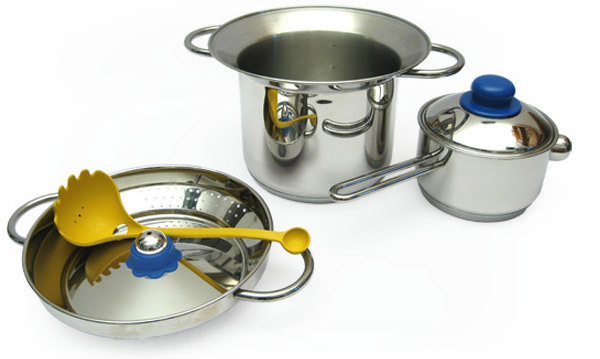 The lid is patented for its original application: it can be put on the pot on both sides depending on its use. Using it by the whistle’s side it closes perfectly the pot so that it can make a hissing sound when the water is boiling (like the tea kettle) informing that it’s the right moment to start cooking the pasta. Using by the other side, it is used for straining the cooked pasta. 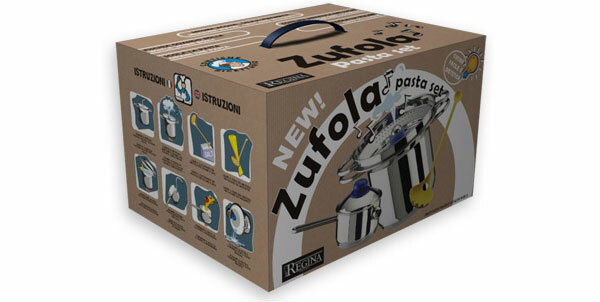 Zufola is intended for cooking the pasta. You pour a liter of water for each portion, using the notches on the pot. Then you add the salt using the batcher end of the ladle: a measure (10 gr) for each person. Afterwards you proportion the spaghetti trough the suitable hole on the ladle (about 80-100 gr for each helping). You put now the pot on the kitchen stove and wait for the whistle to start cooking the pasta. After cooking you turn the lid and strain the pasta. Finally the pasta can be seasoned with the sauce in the meantime prepared in the saucepan and served using the server ladle. 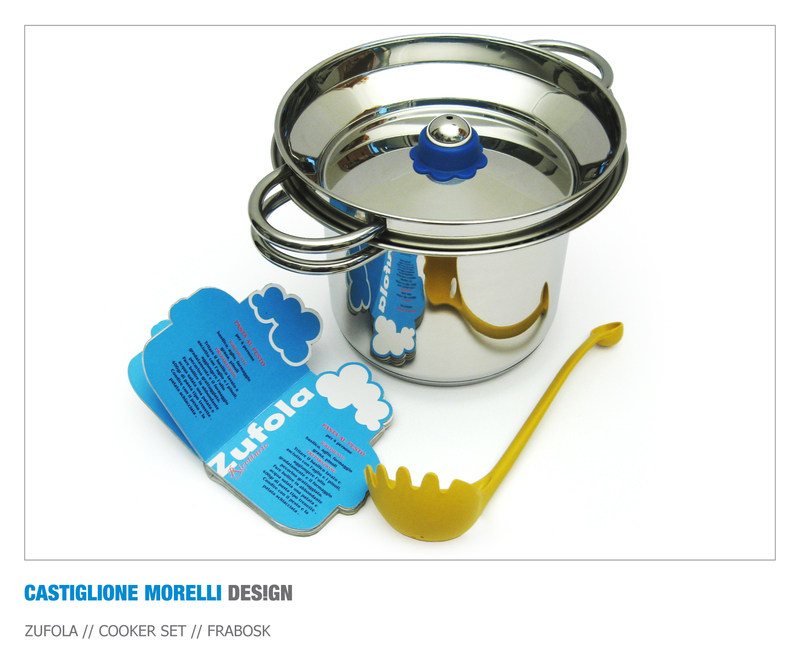 The set includes a pot that whistles when the water is boiling, a saucepan for preparing the sauces and a multifunctional batcher ladle. 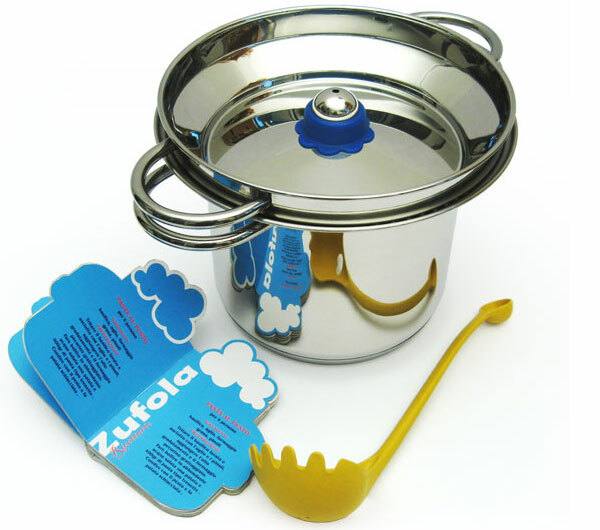 Both the pot and the saucepan are made of 18/10 steel with a triple bottom suitable for all kinds of kitchen (gas, electric or by induction ones); the ladle is made of plastic material. The packaging of the set has the purpose to illustrate the features of the product, above all for the foreign market. Some pictures on one side of the box describe all the possible uses; on the other side there are some easy recipes for making different sauces during the cooking time of the pasta.